Small (L 30 cm) and slender sparrowhawk with difference in size and in colour between sexes. 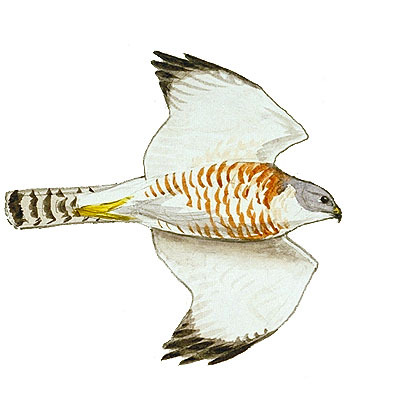 The Levant Sparrowhawk is highly selective in its choice of nesting habitats, rarely occurring outside of fragmented deciduous forest alterning with open grasslands, primarly along river valleys. The principal food comprises lizards, small fledging birds and large insectes. Resident. The EU breeding population is estimated to be not over 1,000 pairs. The agricultural and recreational development of river valleys affects the species' nesting and hunting habitats. This important, especially in view of the species' small population and its rather particular habitats requirements. Sharp declines in lizard populations, caused for example, by extremely low winter or spring temperatures, may also disminish the number of breeding pairs.